(St. Louis, MO) August 3, 2015. Anchor Packaging, Inc. announces the latest addition to their line of Culinary Squares™ bases and lids, offering increased value to the operator looking for ways to improve their image while controlling costs. With the same inside food space as a 9” x 9” foam clamshell, the Culinary Squares™ product line from Anchor offers a truly affordable upgrade from foam. 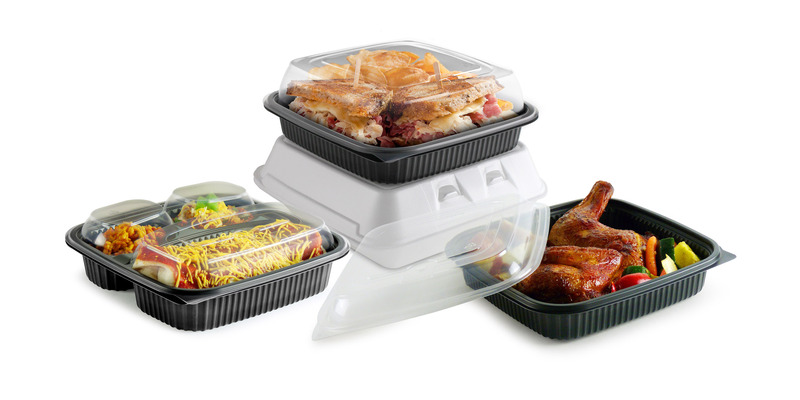 The durable, cut-resistant material of the bases and the food visibility provided by the clear lids, provide the ultimate combination of an upscale presentation at a value price. At a time when food prices are on the rise, this line was designed to maximize performance and minimize packaging cost. A new, deeper dome joins the existing single and 3-compartment, vented lids made with crystal clear polypropylene (PP) with integral Clear Guard™ anti-fog technology. The matching 8.5” square, black PP bases, available in single and 3-compartment designs, accept all three lids designed with secure, leak-resistant closures to preserve the food presentation and avoid messy spills. These packages withstand temperatures to 230°F in warming units, under heat lamps, or in the microwave. No need to re-plate chilled, prepared foods, when reheated in the microwave. Containers are made with a natural mineral additive, reducing the use of petroleum based resin by 40%. Bases and lids are dishwasher safe providing consumer-convenient reusability and are recyclable curbside. Anchor Packaging’s products include affordable and upscale takeout packaging. Used for merchandising prepared, ready-to-heat meals in supermarkets, and for takeout meals offered by restaurants, Anchor’s products can be found in most foodservice operations. Anchor’s unique product line includes stock and custom rigid packaging, as well as a broad line of cling film wraps.